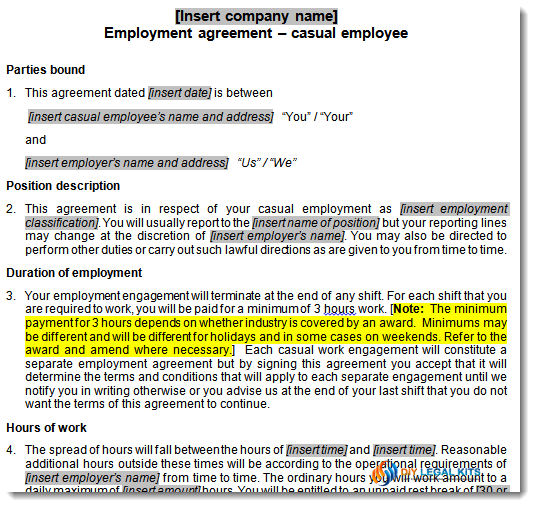 RP Emery's up-to-date Casual Employment Contract is suitable for casual employees employed under a modern award. It contains all the terms and conditions required to comply with the Fair Work Act 2009, along with explanatory notes and a copy of the freely available Fair Work Information statement, which must be provided to every new employee. It's prudent to put the correct employment agreement in place to spell out entitlements and obligations. Knowing the difference between a casual employee and a permanent employee can be confusing and there is no definitive test. However it is accepted that a casual employee is hired on an informal, uncertain and irregular basis. They don't usually receive sick leave or annual leave and should be paid a casual loading to offset this lack of entitlements. Bar staff or shop assistants who are never exactly sure when they will be required for work are prime examples. Available for immediate download, this document comes to you as a Microsoft Word template that can be used as often as you like. Simply insert the correct information in the appropriate field and then tab to the next. Now print your professional contract!